Our local health food store was out of the regular quinoa so we tried red quinoa. Besides the aesthetic, there wasn't, in my opinion, a difference in taste (though some people say it tastes "earthier" than its lighter variation). So for this easy meal I just put together a few ingredients I had in my cabinets. Oddly, my husband declared this the best meal I've made all year which either really says something about my cooking, or this really was that unbelievable (I'm thinking the former). While it might not have been mind-blowingly delicious, it was definitely tasty enough, easy to make, and therefore will be made again. Preheat the oven to 350 degrees. Rinse quinoa. In a casserole dish, add all the ingredients. 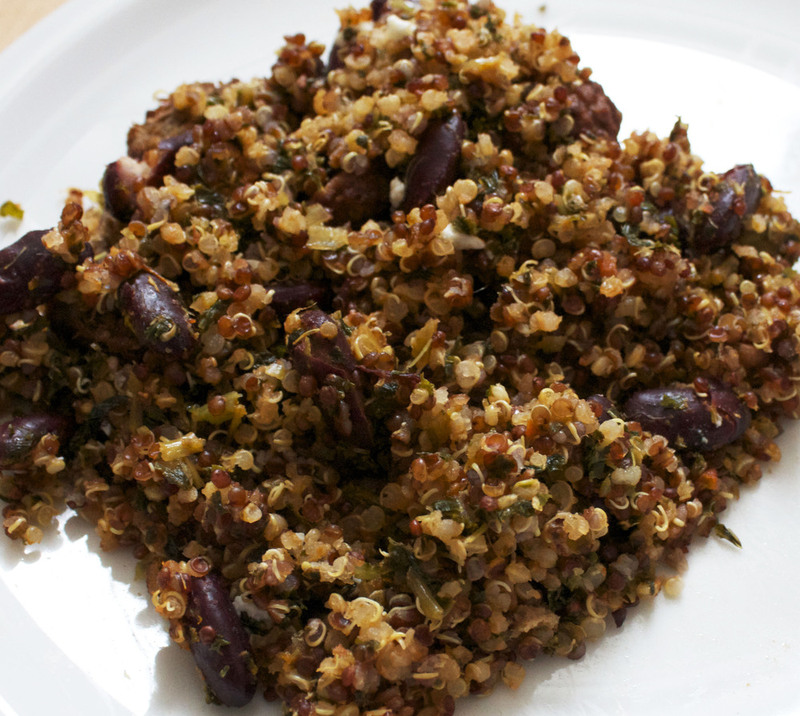 Bake for 30 minutes, or until the quinoa has sprouted. Serve with a bit of crumbled feta cheese on top if you like. Eat and enjoy. PS-A cake made with kidney beans that actually tastes good, a spicy vegetarian chili, and a 12 minute power vinyasa flow to jumpstart your day.